Kenneth Tam’s work of the past several years has been consistently fueled by encounters with strangers, especially those facilitated by online message boards and forums such as Craigslist and Reddit. Stemming from an interest in how people navigate physical interaction and intimacy in shared spaces, Tam’s process often involves the solicitation of individuals whose participation in a given project is at times collaborative yet always serves to undermine the social conventions that are intricately linked to daily life. The various activity-based groups that men create for socializing and bonding provided the point of departure for Breakfast in Bed (2016), Tam’s most recent video. 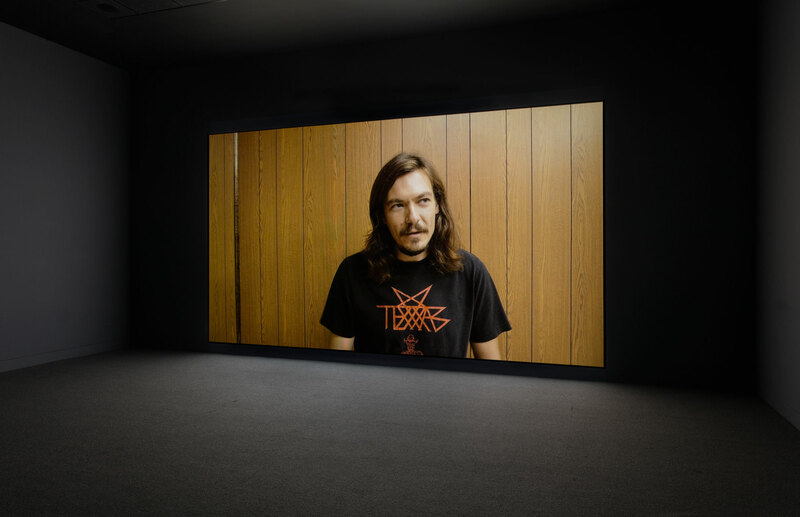 Tam began by recruiting seven nonactors to participate in a mock men’s social club, the activities of which were filmed in a set built within the artist’s studio. Part social experiment, part absurdist theater, Breakfast in Bed is organized around the constructions of masculinity and the male body through role-playing, team-building exercises, and improvised actions that the artist developed with the participants throughout the process under his loose direction. Occupying a faux domestic space, the men engage in a variety of activities that approximate a sense of intimacy despite their apparent lack of affiliation with one another prior to filming. Through staged play, the project examines the constructed identities that the men come to rely on in a group setting while enabling and facilitating their agency to perform themselves in front of the camera.